Excerpt from Raymond Ibrahim's monthly roundup of Muslim persecution of Christians around the world. The State Department initially refused to give a visa to Sister Diana Momeka of Iraq when she planned a visit to Washington earlier this year to advocate on behalf of Iraqi Christians. 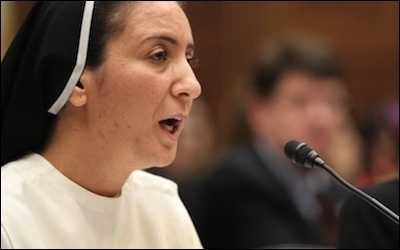 Sister Diana Momeka, an influential Iraqi Christian leader, who was scheduled to visit the U.S. to advocate for persecuted Christians in the Mideast, was denied a visa by the U.S. State Department even though she had visited the U.S. before, most recently in 2012. She was to be one of a delegation of religious leaders from Iraq -- including Sunni, Shia and Yazidi, among others -- to visit Washington, D.C., to describe the situation of their people. Every religious leader from this delegation to Washington D.C., was granted a visa -- except for the only Christian representative, Sister Diana. This is an administration which never seems to find a good enough excuse to help Christians, but always finds an excuse to apologize for terrorists ... I hope that as it gets attention that Secretary Kerry will reverse it. If he doesn't, Congress has to investigate, and the person who made this decision ought to be fired. This is not the first time the U.S. State Department has not granted a visa to a Christian leader coming from a Muslim region. Last year, after the United States Institute of Peace brought together the governors of Nigeria's mostly Muslim northern states for a conference in the U.S., the State Department blocked the visa of the region's only Christian governor, Jonah David Jang. The U.S. insists that Muslims are the primary victims of Boko Haram. It also claims that Christians discriminate against Muslims in Plateau, which is one of the few Christian majority states in the north. After the [Christian governor] told them [U.S. authorities] that they were ignoring the 12 Shariah states who institutionalized persecution ... he suddenly developed visa problems.... The question remains -- why is the U.S. downplaying or denying the attacks against Christians? What is going on there [Islamic State territories], what I was hearing, is the highest barbarism on earth in the history until today... The mission of Baghdadi, of ISIS, is to convert the world completely to the Islamic religion and bring them to Dar Al Salaam, as they call it. And Islam is not peace, please. Whoever says ISIS has no connection to Islam or something like this is, he's a liar. ISIS is Islam; Islam is ISIS... We know that in Islam, there is no democracy. Islam and democracy are opposite, like black and white. And I hope America will understand. America today has the power that they can stop this disaster on the earth, with other Western countries. For the rest of Ibrahim's monthly roundup of Muslim persecution of Christians around the world, click here.